Shining the Light on the truth: Varied Sunlight fades fabrics differently. More than just the “sun shining down” affects how a fabric fades. Variables such as angle of sunshine to fabric, moisture, temperature, climate, etc., all cause different levels of exposure, and consequently, different levels of adverse effects. The angle at which sunlight strikes your fabric matters. For the sake of this example, we’ll assume the fabric is covering a relatively flat item, and the cover is also relatively flat, parallel to the ground. Since you can’t move the sun, increasing the angle (pitch) of the cover not only spreads the intensity of the sunlight across a higher area of the cover but it also enables the rain to bead and flow off and not pool, reducing the concentration of pollution and dirt on the cover during the evaporation process (reducing food supply for mildew growth as well). Therefore, a horizontal cover endures the most intense sunlight per area and tends to pool water, which eventually evaporates, thereby concentrating the pollutants and dirt on the cover. A better alternative is a cover that is tilted 45 degrees, reducing the sunlight per area by about 30%. As the angle of the cover increases, the area that the sunlight covers also increases, reducing the intensity of the sunlight, and fully minimized at a 90-degree (to the ground) wall exposure. In conclusion, a horizontal exposure is the harshest exposure, with an angled exposure less harsh, and a fully-vertical exposure the least harsh. This effect is intensified throughout the summer season since sun rays are more direct (90 degrees from the horizon) during the summer and less direct during the winter. The Power of the Summer Sun: One “sunbeam” (easier to illustrate than using photons!) 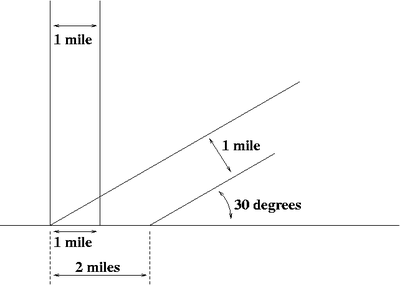 one mile wide shines on the ground at a 90° angle, and another at a 30° angle. The one at a shallower angle covers twice as much area with the same amount of light energy. When sunlight shines on the earth at a lower angle (Sun closer to the horizon), the energy of the sunlight is spread over a larger area, and is therefore weaker than if the Sun is higher overhead and the energy is concentrated on a smaller area. Sun intensity refers to the amount of incoming solar energy, or radiation, that reaches the Earth’s surface. The angle at which the rays from the sun hit the Earth determines this intensity. The sun’s angle -- and hence intensity -- varies significantly depending on a particular spot’s geographic location, the time of year, and the time of day. The angle formed by rays of sunlight hitting the Earth is technically known as the angle of incidence. Rays striking the planet’s surface from directly overhead -- that is, at a 90-degree angle measured from the horizon -- are the most intense. At most times and locations, the sun forms an angle with the horizon less than 90 degrees -- that is, usually the sun sits lower in the sky. The smaller the angle, the greater the surface area over which the sun’s rays spread. This effect reduces the sun’s intensity in any one place. For example, at a 45-degree angle of incidence, solar radiation covers a 40 percent greater area and is 30 percent less intense than at the maximum angle of incidence of 90 degrees. Only locations lying along one line of latitude on the surface of the Earth can receive sunlight at a 90-degree angle on a given day. All other places receive sunlight at lesser intensities. In general, the sun’s rays are the most intense at the equator and the least intense at the poles. On an average yearly basis, areas north of the Arctic Circle receive only about 40 percent as much solar radiation as equatorial regions. Fluctuations in the intensity and duration of solar energy in a particular area determine that area’s seasons. These fluctuations are dictated by the way the Earth is tilted on its axis, as oriented to the Sun. With respect to the plane of rotation around the sun, the Earth slants at a 23.5-degree angle, meaning that at certain points during its orbit, the Northern Hemisphere faces the sun more so than the Southern Hemisphere, and vice versa. For example, at the summer solstice, the Northern Hemisphere faces the sun at maximum tilt, so the sun’s rays strike 23.5 degrees north latitude -- the Tropic of Cancer -- at a 90-degree angle. 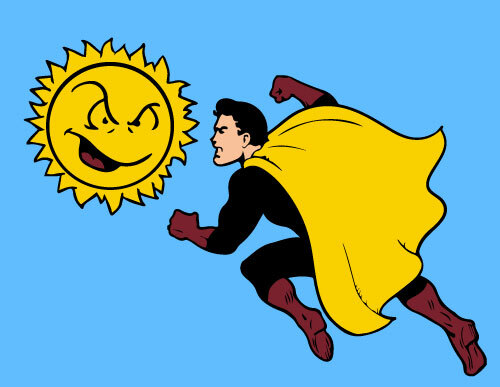 Whichever hemisphere tilts further toward the sun receives a larger percentage of solar radiation than the opposing hemisphere. The former hemisphere experiences summer at this time, while the latter experiences winter. In the hemisphere experiencing summer, the sun rises higher in the sky and is more intense; its rays strike the ground at a higher angle than in the hemisphere experiencing winter. This explains why the risk of sunburn is greatest in summertime. It also explains why temperatures are warmest in summertime, since the sun delivers heat energy. Regardless of latitude or time of year, the sun’s angle reaches closest to 90 degrees -- and is therefore at its most intense -- at the midpoint of the day: noon. At this time, the sun is said to have attained its zenith, or highest point. During daylight saving time, the sun is at its greatest angle and most intense at 1 p.m., due to the manmade one-hour offset from true solar time. The sun’s rays in summer (b) and winter (c). In summer, the sun appears high in the sky, and its rays hit Earth more directly, spreading out less. In winter, the sun appears low in the sky, and its rays spread out over a much wider area, becoming less effective at heating the ground. of solar radiation, and the angle of the sun’s rays directly affects the intensity of the solar radiation received. Locations at lower latitudes receive stronger and more direct sunlight than locations near the poles. That concludes this learning experience at Textile U. Although this was one of our more technical curriculum, we hope you enjoyed it, and feel brighter for the experience.